Dear Readers, the ‘wildflower meadow’ area in the cemetery continues to provide a healthy harvest of vigorous and unusual ‘weeds’. This plant is a member of the daisy family, and at first glance it looks like just another thistle. However, if you take a close look at the base of the flower head you will see a fine mass of little hooks. The burs are also notorious for trapping small creatures, especially birds – on the Plant Lives website, Sue Eland reports how a stormy petrel was rescued from the embrace of this plant, but only after the poor creature had become trapped by his wings, body and feet. You can see how a mouse or finch might end up completely entangled. 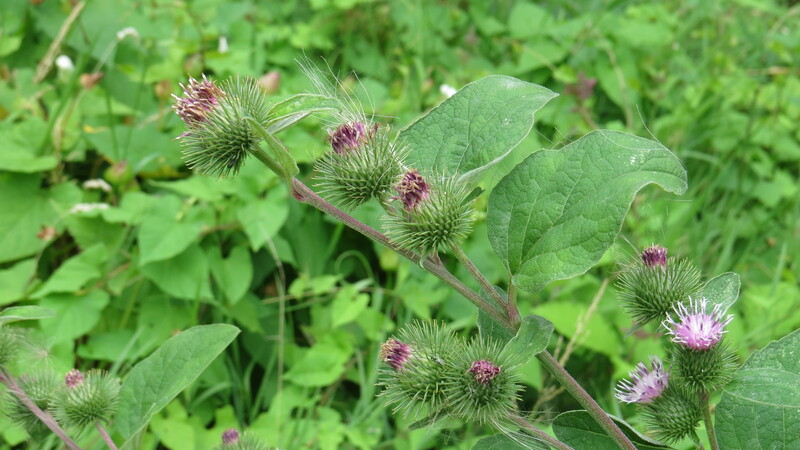 Lesser burdock is a native plant (there is a bigger species, called predictably greater burdock (Arctium lappa) which is an ancient introduction). Although many native plants feature in ancient rituals and folklore, lesser burdock is interesting in having such a ceremony still extant. 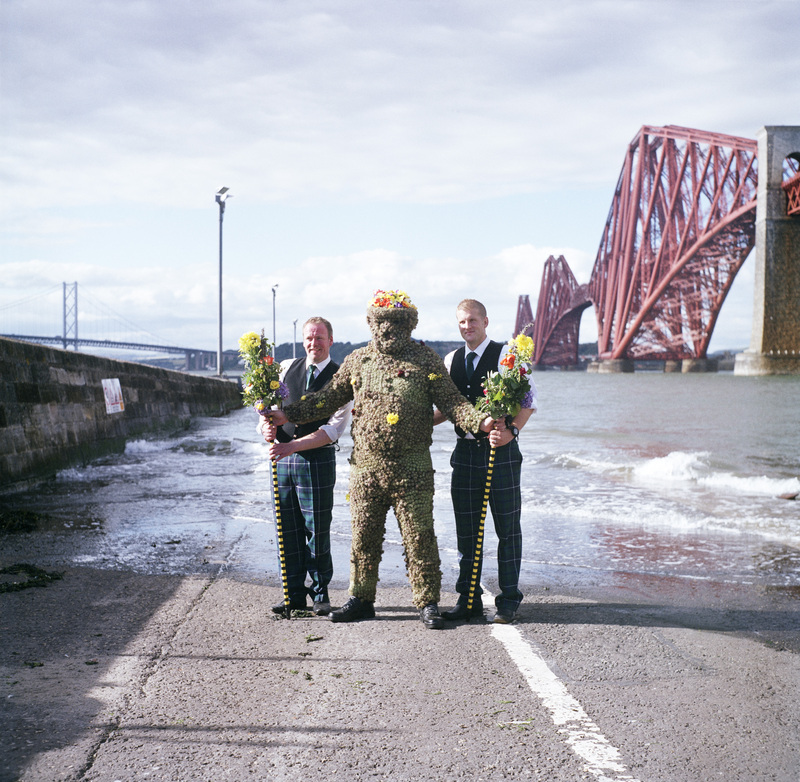 On the second Friday in August, there is a ‘Burry Man’ parade in Queensferry which has been happening since at least 1687. The ‘Burry man’ is completely covered in burs (except for the flowery hat on his head and his feet) and he goes from house to house, receiving gifts and a number of ‘drams’ as he goes. In Flora Britannica, Richard Mabey describes how the costume is made from patches of cloth, each stuck with up to 500 burs which have been gathered by local people and left to dry out. The costume more or less holds itself together, such is the sticking power of the seedheads, and it takes about two hours to cover the unfortunate Burry man. Once in the costume, it isn’t possible to get out of it, so one of the requirements is definitely a strong bladder, plus an ability to withstand the inevitable irritation of the bur ‘hooks’ piercing through the cloth and causing some measure of discomfort. The total perambulation around South Queensferry takes nine hours and, what with the heat, the whisky and the aggravation of the costume it takes a man who is determined to uphold this ancient costume to complete the course. The origins of the Burry man probably have their roots in much more ancient practices, and one interesting idea, again from Flora Britannica, is that the figure of the Burry man was a kind of scapegoat – in Buckie on the Moray Firth, a Burry man paraded through the streets when the fishing season was bad, to bring better luck to the fishing. It may be that the hooks of the burs reminded people of fishing hooks, so there was maybe a kind of sympathetic magic going on. 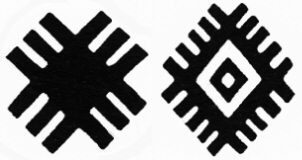 In Anatolia, the burdock is said to be protective against the evil eye, and a motif that symbolises the plant is sometimes woven into kilims (rugs). With its many flowers, it also symbolises abundance. 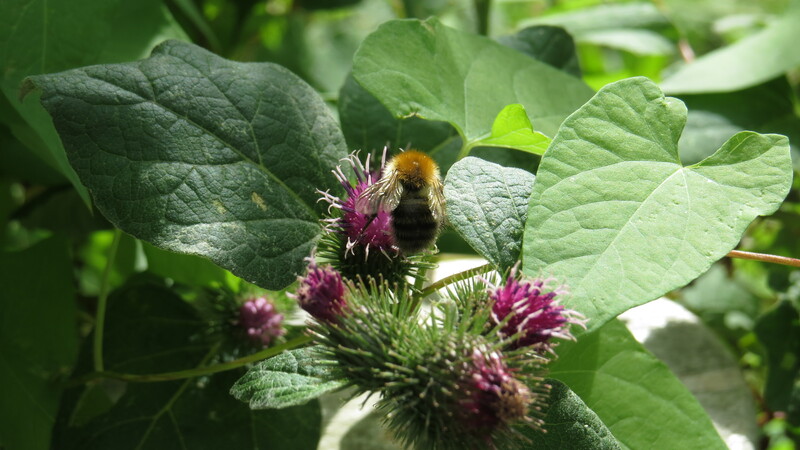 Like all members of the thistle family, the flowers of lesser burdock are very popular with bees (like the common carder bumblebee above). The roots and shoots are also eaten by humans: although the burdock in dandelion and burdock cordial is nowadays imported from eastern Europe as a flavour essence, it was originally taken from the roots of this plant. 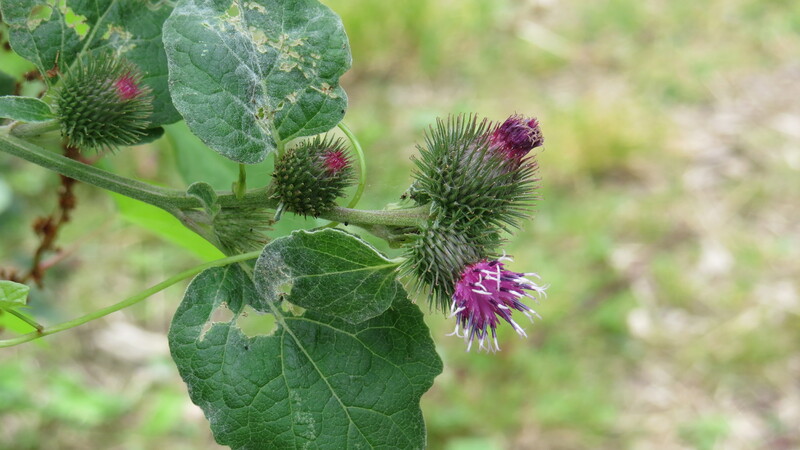 It was also used to make a kind of beer.If you fancy having a go at lesser burdock stirfry, there is a recipe here, but note that burdock is a biennial, and only the first year roots are considered suitable. In other words, if your plant already has flowers and burrs, you are too late. 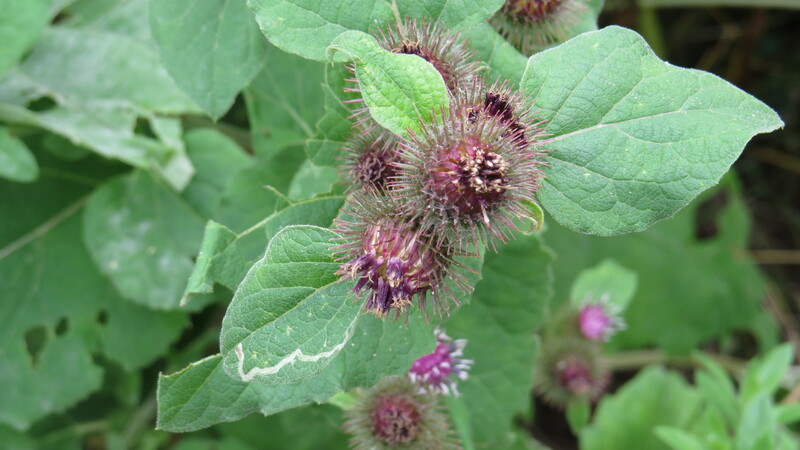 Lesser burdock has a variety of uses in traditional medicine. It is considered to be a diuretic, a disphoretic ( a substance that causes sweating) and an excellent blood purifier. 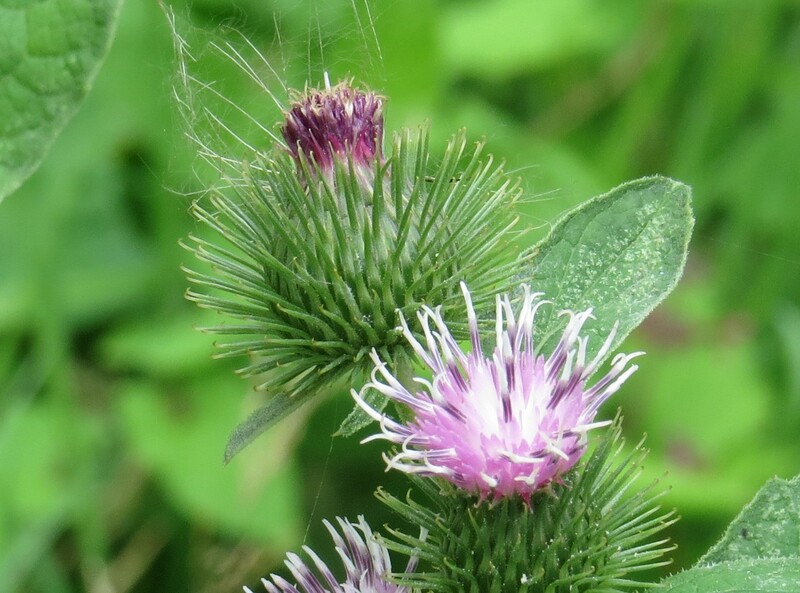 Burdock root oil is also said to be a fine scalp treatment. 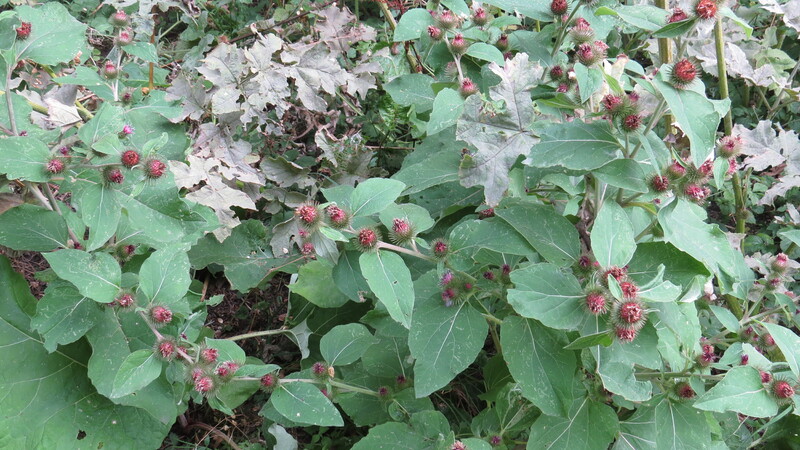 All in all, I am very impressed with lesser burdock. It has been used medicinally and for food, it is a key part of one of the few ancient folk rituals that are still being performed in the UK, and it provides nectar at a time of the year when many other plants are waning. Furthermore, it was the inspiration for velcro, which does everything from fasten my parents’ shoes now that laces are too difficult, and keeps the front of my waterproof secure when there is a downpour. The burs might be a bit too ‘sticky’ for comfort sometimes, but it seems to me that this is a small price to pay for the pleasure of its company. And I am aware that the area where it grows in the cemetery is likely to be completely ‘exfoliated’ shortly, and all the perennials and biennials will be destroyed, so I am making the most of this most eccentric of ‘weeds’, because it will soon be gone. Though I do wonder how many dog walkers will be transporting its children to the most distant parts of the cemetery and beyond. I shall look with interest to see where else this plant might ‘crop up’. All other photos copyright Vivienne Palmer. Free to use and share non-commercially, but please attribute and link back to the blog, thank you. This entry was posted in London Plants on August 17, 2016 by Bug Woman. I felt very sorry for the Storm Petrel, lucky that it was found and rescued. Dandelion and Burdock used to be a favourite summer drink in my childhood but I think have never seen the plant.